After reading Stans hurry, hurry thread it made me think it would be fun to start posting some of the odd, funny, or ridiculously priced Ebay auctions for printing equipment don’t you think? bad enough its $2500, but shipping $500. Would you need a train station to operate this great machine??? Ridiculous! But remember, you could cut linoleum blocks in multiple colors and print your own money on it! I couldn’t resist telling him what it is. Now I will be interested in seeing whether he changes his ridiculous description. Haha, I’m pretty sure this listing has been around for a year or more, the description getting more fanciful over time. It would seem the antiques dealer sold the seller quite a yarn along with this thing. Id pay $600 to ship this item. great bargain. Makes you wonder how much he paid for it. I am glad to learn that I must have $25,000.00 worth of railroad station ticket presses in my shop! I about fell out of my chair when I read the delivery line. The estimated freight is for delivery to 50167. 50167 is MY zip code (!!!!!!!!!) which is in rural central Iowa. How that zip code got pulled out of the hat has me completely baffled. I have never bought or sold anything on e-bay. No need to worry, Rick. Ebay knows your computer’s network (“IP”) address (it has to, in order for you to communicate with it). It (Ebay) is just looking up that address to see who owns it (your internet service provider) and where they’re located. It’s not surprising that they found you, especially if you have a relatively small ISP. Thanks David for clearing that up. Oh the technology!!!!! I’m glad that it probably won’t show up at my back door with a bill for $3,000 (press & freight). I do have ten copy presses in the shop. 9 of which are in the 10” x 15” platen size or slightly smaller. I do however also one very impressive monster that has a platen size of 15” x 20” and this puppy weighs about 300 pounds!!!!! It came out of a bank in central Iowa. It was the most expensive one I ever bought and it was only $50 (I started collecting these decades ago). The big one has Rand McNally & Co. Chicago written in gold ink in a very fancy Spencerian backslant style on top of the platen. Rand McNally was not the manufacturer, just the original purchaser of the press. Yikes! I can’t believe that little card press went for that kind of money! Sure, it’s kinda cute and might be a bit rare, but i’d never guess that sort of cash. The odd thing is that a number of folks actually bid the item up. Maybe they all know something we don’t. After all, we’re just printers…. and don’t live in the rarified air of the sophisticated collector. The first bid was mine, as I have the larger model from this series, and it would have been cute to have this sitting next to it. Then things got crazy. Wow! That seems like an astonishing amount of money for that press. I have two of them and they make charming bookends. Here’s the story of how I acquired the second one. Bill McGarry used to host most of the early Annual Midwest & Great Northern Printer’s Fair each Fall. For a few years it was held at the Minnesota Center for Book Arts.. The first time it was there, the MCBA had their own table to sell excess small presses, etc. They were all priced at well over $100 and not a one of them was sold. That was just way too much to pay in those days. They hosted it again the following year. In the interim there was a new director, and he (she?) knew that nothing had sold the prior year so instructed them to reduce the prices to a cost where they would sell. Chuck Wendel and I had gone up as vendors and were setting-up on Friday evening. We were located in one area and the MCBA was going to set-up their table in another area. They eventually brought out all of the little presses and miscellaneous other things and spread them out. When I noticed someone going around and placing price tags on them, I wandered over and took a look. Unbelievably, the presses were marked at around $15 each!!!!!!!! I grabbed Bill McGarry and pulled him over to show him this. We looked at each other and immediately each grabbed a press, and paid for them on the spot! We then walked back to my area, each holding our treasure and we told Chuck that he better hightail it into the next room because they were selling these presses for around $15 each. Chuck was seated comfortably behind his table and looked at us skeptically and said “Yeah, right.” We both told him this was true, but he believed we were pulling his leg and said he was not going to get up and go on a wild goose chase. The more we tried to convince him, the more stubborn he became. Bill finally walked away with his press and then I went to my table and put my press underneath it. Chuck asked “What the H… are you doing?” I told him I was putting my press away because I just bought it. The lights finally went on for Chuck and he ambled to the other room. Too late, they were ALL gone! At those prices I knew they would go fast. I have a card-press bookend myself, works great for that, not sure about the printing capabilities. I got mine off ebay for $25, I’ve been pretty lucky on there over the years. Amusing (to me) id of the berries half of a two color holly, but, at least he questions his conclusion. I picture the Monty Python crew playing a board game and everyone bewildered when seeing this pattern come up on both dice over and over. ₡ 2,771,618.63! What a bargain! Here is another guess on ebay as to what the berries half of a two color holly is used for. If these were actually for printing braille, I think it would get very boring reading the same thing over and over again. I was going to say how this one struck my funny bone, but, I think it was a different bone. I could talk about a number of issues on this auction and his others as well, but, I was particularly struck by his desire to not break up these “fonts” It’s exactly what we need of more sellers. People realizing it is better to not break up a font and sell individual letters. Yup, it’s “all or none” You must take all four or these babies are not going anywhere. The title reads “Small Letterpress Printers Spare CHASE Aprox. 2.5” x 4” Adana?” and they are asking $34.00. Just be aware, that if you are going to use this as a chase, it is metal nailed to wood and it is type high. What do you think of this one? Looking closely at the photos it does appear to be original woodwork. 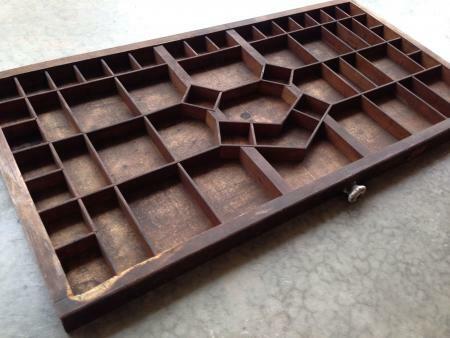 Does anyone know if this is a real type tray or is this a tray designed for something else? It certainly has the look of a type case — perhaps for a language with a different character set and usage quantities from English or Romance languages. The compartments in the middle are strange though.